Construction workers returned Monday to the stadium that will host the opening match of the 2014 World Cup, five days after an accident killed two workers and renewed questions about Brazil's readiness to hold the tournament. While the area around where the accident occurred remained off-limits, authorities gave the green light for the Arena Corinthians site's 1,350 workers to resume work on most of the site Monday. However, the Labor Ministry has frozen the use of the site's nine other cranes until Odebrecht shows adequate safety measures are in place. 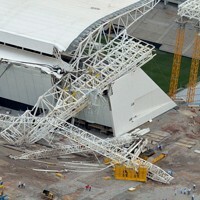 Small groups of stonemasons, metal workers and others trickled into the Itaquerao Stadium in Sao Paulo early Monday morning. Ahead of the resumption of work, more than 100 workers gathered early Monday on the opposite side of the stadium from where the accident took place for a Mass honouring the two victims. The cause of the accident was not yet known, but investigators have said they were looking into the hypotheses of human error, a problem with the crane and also the possibility that the ground, soaked by recent rains, ceded under the weight.